With digital radiography we can offer a faster, safer and easier x-ray diagnosis than ever before with less radiation exposure than traditional radiography. This also means there are no chemical solutions used to process the films and thus less environmental pollution! Dental x-rays are preventative diagnostic tools that provide valuable information not visible during a regular dental exam. Your tooth is composed of several layers with a large section hidden below your gum line and in your jaw bone. Damage, infection or abnormalities below the surface are often invisible but cannot be ignored. 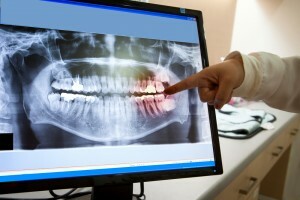 The need for dental x-rays depends on your individual needs. Your dentist and dental hygienist will recommend necessary x-rays based on your medical and dental history, dental exam, signs and symptoms, age consideration, and risk for disease.